CHASING FOOD DREAMS: La Cucina Mediterranean Kitchen, Pullman Kuala Lumpur Bangsar: Dining in an Urbane Italian & Mediterranean Kitchen! La Cucina Mediterranean Kitchen, Pullman Kuala Lumpur Bangsar: Dining in an Urbane Italian & Mediterranean Kitchen! Staying True to the Hearts of an Italian and Mediterranean Kitchen! Home is where the heart is… and nothing feels homier than the smell of delicious food wafting from the kitchen to make one feels at home! La Cucina Mediterranean Kitchen, one of the latest restaurants to hit town is located at the new Pullman Kuala Lumpur Bangsar. Homing in the idea to make guests feel at home, La Cucina warmly invites guests to dine openly with an open kitchen right in the middle of the restaurant. Next to La Cucina, The Lounge has the perfect ambience to greet guests with retro and modern cocktails prior to dinner. Our groupie had a lovely time relaxing to the many creations of giggle juice such as Cosmopolitan, Cucumber Martini, Pullman Connection, Mojito and more that evening. A must-order is the delicious Pullman Connection, fresh and addictive while the Cucumber Martini didn’t fall far too behind. What makes The Lounge even better is the individual Arabian inspired marquee perfect for lounging. As we head over to dinner, we really can’t help but to admire the bright colors of the restaurant. 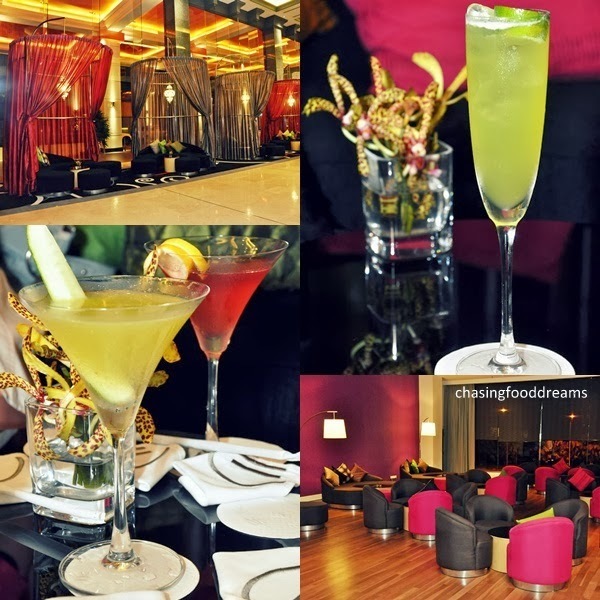 Orange hues are splashed with bright colors all over through the dining booths and furniture. 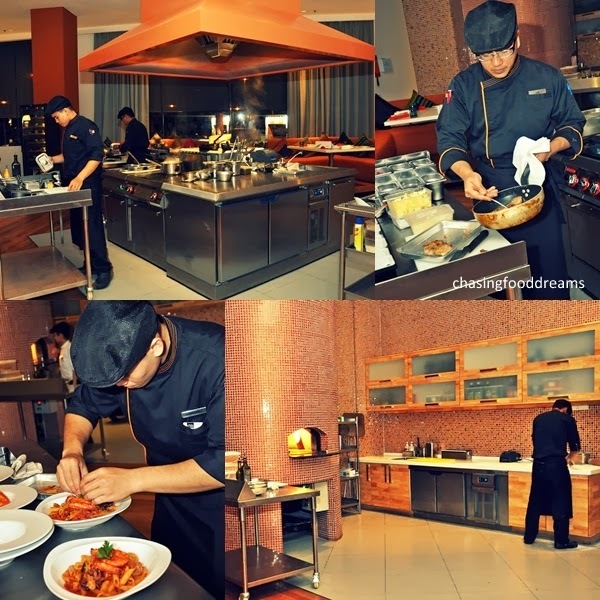 The open kitchen takes center stage as everyone is able to view the kitchen action from every angle of the dining room. There is even a side kitchen with minimal cabinets and a pizza oven covered in light pastel orange tiles. I was told that there is a long communal table at the restaurants of all Pullman Hotels all over the world. The communal long table symbolizes the warmth of large groups of family and friends dining together through the ‘heart of the home’. Here it is a modern design of simple contemporary long table with high chairs. Dinner started with a must-have at every Italian or Mediterranean home, fresh warm bread to be eaten with extra virgin olive oil, balsamic vinegar, butter and olive tapenade. There is even Grissini for a great crunch. La Cucina has its own Marsala Wine and guests may order their meals to be added with the Marsala Wine as an option. As we catch some kitchen action, our stomach grumbled continuously upon the heavenly smells of pasta and more wafting through the air. We even took a closer look while Sous Chef Aidiyusman Mohammad Yushoff whipped up our meal. Armed with a list of impressive career experience from all over the world, Chef Aidi finally returned home to joined the Culinary Team at Pullman Kuala Lumpur Bangsar as sous chef in charge of La Cucina. He masterminded La Cucina from his experience in Vincenza, Italy to make it his own. Pasta reigns supreme together with Pizza. At the first bite of Penne Fruitti Di Mare, I immediately recognize the familiar authentic taste of fresh tomato sauce laced with seafood on al dente penne. Simplicity at its best, the pasta was delicious in flavors. Chunks of octopus, prawns, mussels and more makes a great compliment with the light tomato sauce. Linguine Prawns has strands of pasta tossed in lemon butter sauce with sage, roasted spiced walnuts and shaved pecorino. Light, lemony and buttery, this is a dish that won’t leave one heavy. It also lets the ingredients shine beautifully in the flavors. Smoked Duck Spaghetti was my favorite pasta that night. Salty smoked duck, herbs and chili makes the dish extremely tasty and scrumptious. There is a lovely kick of chili heat, making the pasta utterly irresistible coupled with the smoky duck breast. Let’ not forget the authentic al dente pasta. The dish warrants at least an eight out of ten in my books. From the main course menu, we had Red Mullet Fillet which was lightly pan seared to achieved a crisp skin and soft flesh. What brought the fish up to another level was the beautiful saffron infused seafood bisque served on the side. It had creamy and citrusy flavors, making the fish vibrant in taste. Braised Australian Grain-fed Beef Cheek had us all praising how tender and warm the cheeks were. We cut it using our forks to reveal soft creamy parmesan polenta beneath while a side of olive tapenade together with some vegetables accompanied it. It’s hearty and filling. I was especially in love with the creamy cheesy polenta. Pizzas are a must at La Cucina. Hand tossed and medium thin based, take your pick from the eleven choices available or simply go La Vostra and make your own creation. For the first time in a long line of pizzas, I was glad to see that the pizza menu stayed true to simple and minimal ingredients. There is no localized ones like Hawaiian of some sort here. Don’t get me wrong but it’s great to see pizzas going the more holistic Italian approach. We savored Sliced Turkey and Vegetarian. Our Sliced Turkey had lots of turkey meat with tangy sun-dried tomatoes, olives and spicy capsicum compote while the Vegetarian featured fresh tomato sauce with assorted vegetable and mushroom toppings with shaved pecorino. My favorite was the Sliced Turkey with the punchy sun-dried tomatoes. It is just a burst of comforting flavors in every bite. La Cucina has its own chillers filled to the brim with Salads, Appetizers and Desserts to tempt you at the front. Of course we could never say no to desserts and that evening, we ended our meal with a long list of desserts. As the dessert menu changes on daily, make sure to check out some of their signatures like Crème Brulee, Apple Pie, Cinnamon Cheese Cake, Mix Berries Crumble, Crostada, Cardamon Chocolate Crème Brulee, Tiramisu, Carrot Cake and more. My favorite was the Chocolate Cake that was so feathery light and yet hits one with an overdose of chocolate sensation. The Orange Cheesecake was also lovely, creamy, rich, cheesy and scented with a good dose of orange peels. Raspberry Lemon Cake, Carrot Cake and Mixed Fruit Pavlova were also much raved by the gang. We also savored Chocolate Tiramisu, Baklava and Olive Oil Cake before finishing with coffee and tea. Indeed it was like dining at home, an elegant and modern home. La Cucina is perfect for families and friends as well as business occasions. It has all the comings of an elegant and yet comforting dining experience bundled at one restaurant. The menu is rich and authentic, staying true to its roots of Italian and Mediterranean inspired themed. The smoked duck breast pasta looks promising! Love those freshly made italian bread with evoo and aged balsamic too! What a lovely presentation of the tiramisu. I love the smoked duck pasta and definitely don't wanna share it!